There is no way to spin the Raw rating on Monday as a good thing or even a neutral thing. It’s a bad thing. Fewer people the last two weeks have watched Raw live as it aired than at any time in the last 18 years. Mitigating the panic should be the fact that WWE fans have options now to watch Raw on DVR or even Hulu+. So when comparing viewership numbers this week to 10 or 15 years ago, the substantial increase in DVR viewership (which is much more than VHS tape delayed viewing back in the ’90s and early 2000s) and the extra viewers via Hulu (which is not made public, but I’d guess is in the tens of thousands or at most the 100,000 range, but certainly not hundreds of thousands) does mitigate somewhat the perceived drop in WWE’s popularity. That said, when you look at the ratings the last three years, when Hulu+ was around and certainly DVR viewership was an option, the dropoff this year compared to those years is drastic and alarming. In our poll results (backed by similar results in the www.ProWrestling.net Raw poll), the show received a lot of thumbs up (32%), a lot of thumbs down (38%), and a lot of thumbs in the middle (30%). I had a lot of issues with this week’s Raw and give it a strong thumbs down. However, there are some nuances to the critique. A lot of my issues with the show didn’t have to do with the “immediate viewer experience” or even how well the show built to Night of Champions. A lot of my problem had to do with the show exhibiting the symptoms of what is dragging down the mainstream interest in Raw over time. I think it’s ridiculous to debut Sting on Raw and not hype it a week or two ahead of time. That’s a terribly inefficient use of Sting. Matching him up against Big Show and then having Michael Cole declare this evidence of “how far the sports entertainment industry has come” since the late ’90s was just ridiculous; it’s an example of the opposite being true. The way Sasha Banks vs. Paige was just thrown out there like a Santino vs. Zach Ryder match two years ago would have been was disheartening. Even the overly-scripted and heavy-handed acting in the Miz TV segment, which otherwise had some redeeming qualities, brought the show down for me. Plus the Dolph Ziggler-Summer Rae storyline is just a mess. Why are cheering a guy giving gifts to Summer Rae when the supposed love of his life, Lana, is nursing her arm after wrist surgery? And don’t me started on how awful it remains to have Stephanie McMahon and Triple H opening Raw with a cheerful pitch of the great show they’ve put together for the fans, when their primary goal is to get heel heat by backing Seth Rollins’s title reigns and just being jerks in general. I wrote yesterday about my main issue with the episode, which is how their portrayal of the Bellas reveals their mistake in recent years of pushing the WWE brand above all else, and why they pay a heavy price for it. Check it out here. 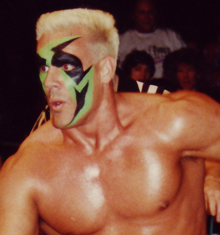 As was the case when he became NWA Champion 25 years ago, and as was the case when he was leaned on to the centerpiece of WCW and later TNA, Sting just doesn’t deliver when put in a top spot. His Rolling Stone interview this week and his Houston Chronicle interview this week (recap here) illustrate that lack of passion and “fire in his belly” that I think tends to undercut the general sense fans have that he’s a charismatic superstar they want to get behind. It’s a fair and honest answer in one respect, but the problem is this is not an attitude that sells tickets, and Sting has yet to give that promo on TV that conveys any sense that he really, really wants to be WWE Champion. As Jim Ross told me a few weeks ago on my www.PWTorchLivecast.com podcast interview, he doesn’t think Sting has a burning desire to add a WWE Title reign to his resume. That’s fine that at this stage of his life it’s not vital to his self-esteem, but his job on TV while in character is to sell fans on the idea that it means the world to him. And he has yet to do that. There’s just a nonchalance to his approach to promos and most of his in-ring work that works better for a mail carrier going about his business than an inspirational super hero on TV trying to stamp out an evil antagonist and take away the championship that means everything to him. -Listen to Jason Powell from www.ProWrestling.net and me talk about this week’s Raw in depth, along with other current topics, in the Tuesday edition of the PWTorch Livecast. We took live calls and addressed email and Twitter contributions, also. -I will be interviewing Jake “The Snake” Roberts live tomorrow and taking your calls for a full hour starting at 5 ET /2 PT (that’s a half hour earlier than in the past). Join us at www.PWTorchLivecast.com to stream it live, or listen on demand later at that same URL. PWTorch VIP members can hear my 30 minute review of the documentary on Jake Roberts that I was able to screen last weekend. Not VIP? Go VIP here: http://www.pwtorch.com/govip. -Speaking of podcasts, a new site we launched this month is called PWPodcasts.com, which recaps and reviews all of the top pro wrestling podcasts hosted by big names from the industry or featuring interviews with wrestlers and others in the industry. If you can’t keep up with all of the podcasts out there, this will tell you what they’re saying that you’d otherwise be missing. If you can listen to some podcasts, this can help you decide which ones are worth your time. We even provide time stamps so you can jump to the subjects that interest you the most! And there are direct links to all of the podcasts so you can jump right into listening to them if you like what you see in the summary or review sections of the reports. Check it out right now, including new reviews in the last 24 hours from Steve Austin Unleashed with Jake Roberts, Chris Jericho with Dana Warrior, Vince Russo’s Raw Video Blog, Taz’s first two episodes of his new daily podcast, and my interviews with Scott Hall & Justin Credible on last Thursday’s PWTorch Livecast. Again the site’s URL is PWPodcasts.com and it is customized for your computer or smaller mobile devices. to check out the latest news and exclusive features, or check the sidebar on the right for the latest PWTorch and MMATorch headlines.